Need to stretch your apps budget? 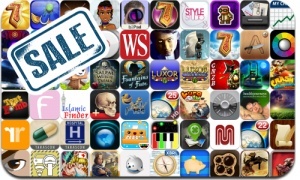 Here are 64 iPhone, iPad and iPod touch apps that just went on sale. This app deal alert includes Luxor Amun Rising & 2, Dungeons & Such, Caylus, Midnight Mysteries: Haunted Houdini & Devil on the Mississippi, Neuroshima Hex, Paper Monsters, 7 Wonders: Magical Mystery Tour, League of Evil, and many others.